My 15 year old son, Hari S who is studying in 9th Standard was diagnosed with Blood Cancer during the month of August 2014. He has been undergoing treatment in Chennai Government hospital for past 1 year. Initially there was a significant improvement in his condition, but from the test done in July 2015, they found that his condition seems to have deteriorated. 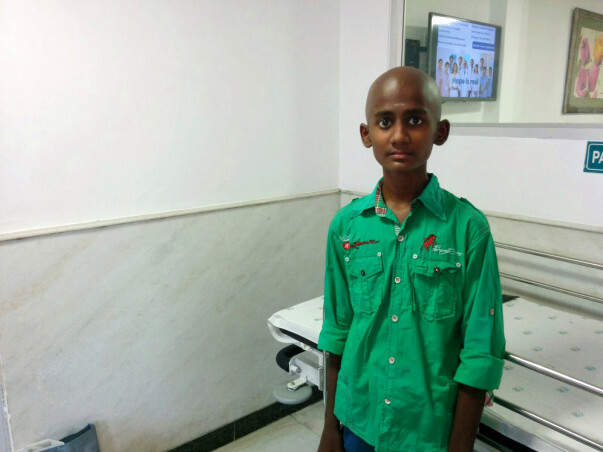 Hence based on the doctor's advice, we had moved him to Apollo cancer speciality hospital, Teynampet. 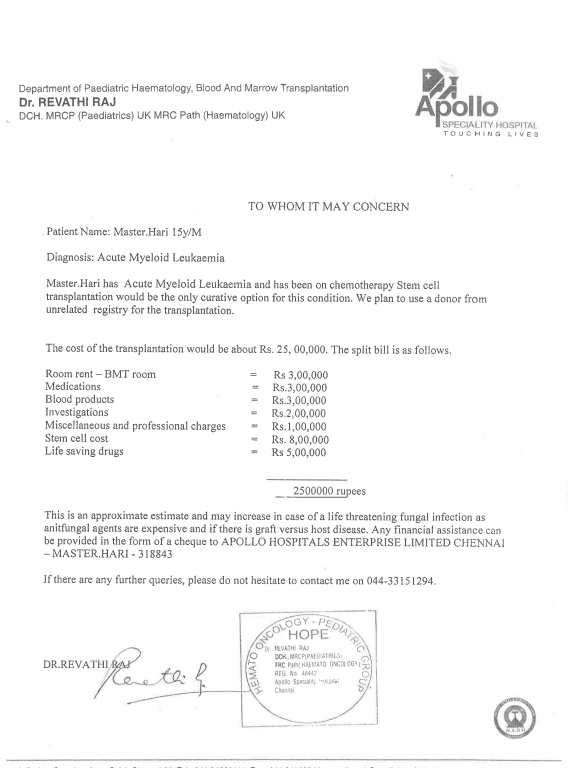 We had already spent around Rs.6 Lakhs till date for chemotherapy treatment and the hospital has told us that the Bone Marrow Transplantation would cost another Rs.25 lakhs. The procedure should be started immediately. I am not from a financially well off background, and not in a position to bear the cost of Rs.25 lakhs for this procedure. Kindly request you all to help my son to fight this condition. Here's an update on Hari's treatment. Hari is now admitted to the hospital. He was doing fine and was under constant follow-up check-ups. Unfortunately, his cancer has relapsed, affecting his spinal cord. He is under treatment. We are in touch with his mother who is in the hospital with him. Do keep him in your prayers. We will keep you posted on his progress. Hari is admitted to the hospital after he had difficulties taking food. It's been 8 days since he is admitted. There is some infection and he is put on antibiotics. His mother informed that he will be in the hospital for another 5 days. Hari's doctor has informed that there is nothing to worry about. We will keep you posted on his progress. Hari is making good progress. He has an appointment with the doctor on 27th of this month. He needs to undergo few tests and will be on medications. Hari is now with his mother in his hometown. We spoke to Hari's mother today. She is happy to be with her son and asked us to share this update with you all.